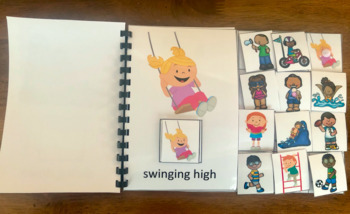 These Interactive Visual Books have been like gold in my early childhood special education classroom this school year! My students have become more engaged during group time and they have been a great connection to home when sent home for parents and students to read and interact with together. After our theme unit is finished, I send these books home with students for a couple of days. The feedback from families has been phenomenal! 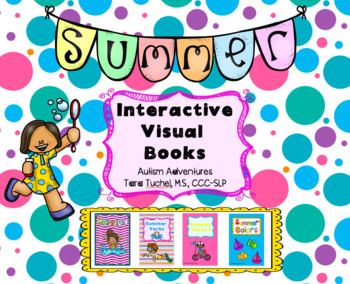 This product includes 4 summer themed interactive visual books with 12 pictures in each book. 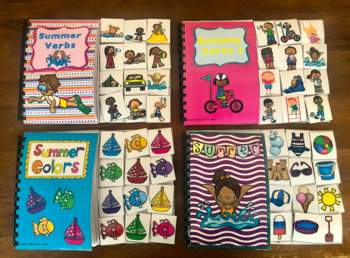 The books are: Summer Vocabulary, Summer Verbs 1, Summer Verbs 2 and Summer Colors. Two books are at the simple one word level and two books are at the two word level. 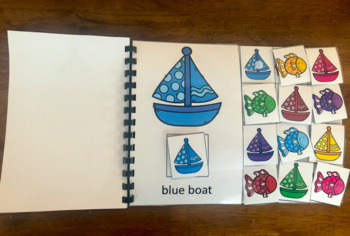 As the teacher reads the book, the student is asked to remove the correct picture from the array of pictures on the right and match it to the picture on that page in the book.